John Carey has seen several sea changes in the ever-evolving media industry. Most professors didn’t choose academia to become media stars. But personality-driven new media is here to stay, and many academics are nervously sailing into uncharted waters. As a professor of communication and media management in the Schools of Business, John Carey, Ph.D., FCRH ’68, isn’t concerned for the profession, as he has studied similar changes for decades. Whether it’s politicians dealing with their televised images in the 1960s, or television networks dealing with a multitude of platform choices in the 2010s, Carey’s fascination with media theory has adapted with the times, with a particular focus on behavior as it relates to new technology. Much material is analyzed in When Media Are New: Understanding the Dynamics of New Media Adoption and Use (University of Michigan, 2010), which he coauthored with Martin C.J. Elton. 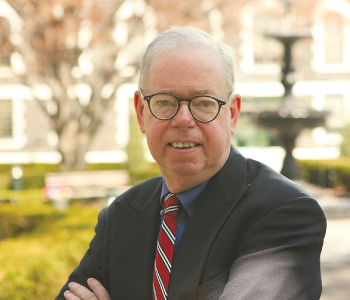 After studying at Fordham with renowned media theorist Marshall McLuhan, Carey went to the University of Pennsylvania’s Annenberg School for Communication, where he wrote his dissertation on political candidates’ behavior on and off camera. But Kennedy’s media camp understood the effects of harsh TV lights. They purchased makeup at a local drugstore and applied it to their candidate in private. Carey went on to study the convergence of broadcast television and telecommunications via an interactive television system that linked five senior citizen centers by two-way cable. What was initially funded as a way for the seniors to share information on social security and nutrition, via a local cable channel, became a space for seniors to meet and have fun. One particularly popular segment featured Mary, a former recluse at the center who presented weekly bargains found at local supermarkets. Her cable segment was simple: she clipped sales news from the newspaper and then read it to the cable audience. In her own low-tech way, Mary had “gone viral” and become a local celebrity, said Carey. Most recently, Carey completed a study for NBC that focused on the use of second and third screens by television viewers during the 2012 London Olympics. He found that, counter to what some network executives had feared, smartphones and tablets did not detract from TV viewership; rather, they whetted viewers’ appetites to watch the events later on television. Whether they be politicians, doctors, senior citizens, or consumers, people altered their behavior alongside of evolving technology, Carey’s research has shown. Clearly, changes are coming to academia too. “There is no question that online classes will become more prevalent,” said Carey. Whether the future of academia will focus on personality-driven lectures for Massive Open Online Courses (MOOCs) or simply enhanced interaction on Blackboard, is fodder for debate. Carey doubts professors will need to develop on-screen personalities, but their presentations will matter more, as will their ability to interact online. While he does not recommend an all-out plunge into the Twittersphere, he does believe that faculty should embrace the changes at least incrementally. He suggested media newcomers begin by holding more group discussions on Blackboard. He also urged incorporating Skype and YouTube into lectures. Academics who believe the academy’s on-campus enrollment will drop with online delivery platforms may also be mistaken, Carey said, just as NBC executives were mistaken about TV viewership and new platforms.